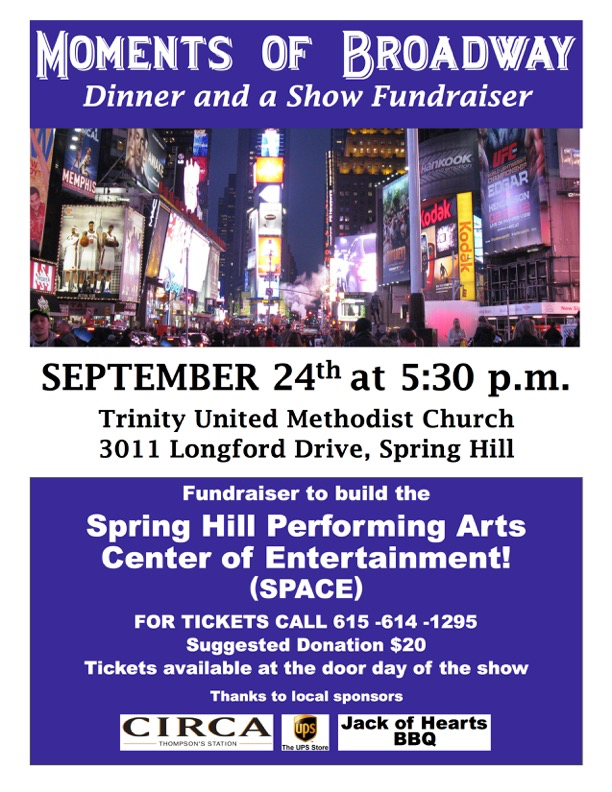 "Moments of Broadway" is presented by the Spring Hill Performing Arts Center of Entertainment (SPACE), a local nonprofit theater group originated by the Arts Commission of Spring Hill. The show is an effort to bring performing arts to the community and raise funds to build a SPACE. Directed by Artistic Director Ricky Lynne, the show will include performances by the Spring Hill Orchestra, Vox Aurea (Heritage middle school chior) All that Dance, Sabre Music Entertainment Artists Jackie Davis and Hayley Zayne, HarMoniX, and many other local youth and adult performers. The performance is the stages of love as told in "Moments of Broadway" to express a love for the arts and a need for SPACE. The goal is to one day build a professional, unique and diversified entertainment complex to allow local arts groups to perform in Spring Hill for our community to show that Spring Hill supports the arts, and to entice outside groups and tourists to visit Spring Hill to be entertained and to perform. Tickets are available in advance by calling 615-614-1295 at SPACE or by visiting any of the involved arts groups. The show is at 5:30 p.m. Sat., Sept 24, at Trinity, 3011 Longford Dr., in Spring Hill. Tickets are a $20 donation to the effort and are suggested to be purchased in advance.